RACE REPLICA PERFORMANCE AND FEELING. The primary goal in creating the RSV4 was the same one that has set this model apart from its birth in 2009: to be the absolute best uncompromising superbike, the one that comes the closest to the current Aprilia racing bikes in terms of performance and effectiveness. Thanks to the experience acquired in the most selective speed championships such as WSBK and MotoGP, Aprilia is able to transfer technologies to their factory products like the full Ride-by-wire throttle and the dynamic controls package, APRC. Aprilia RSV4 is the natural evolution of an innovative project, capable in just a few years of dominating World SBK, earning sevenworld titles in six years and winning in its début in the FIM Superstock Cup, the championship dedicated to bikes that are closely derived from their factory versions. Unanimously acclaimed by critics and sought after by bikers from every corner of the globe, the RSV4 has always been the undisputed segment representative, the reference point for sportiness and performance, the best example of what can be achieved by exploiting the valuable experience of a victorious Racing Department like Aprilia’s which, in its brief history has taken 54 championship titles. Skills honed on the track and transferred to the factory product to provide everyone with the same excitement that the motorbikes prepared by Aprilia Racing do. The primary goal followed during development of the Aprilia RSV4 (in both available versions, RSV4 RR and RSV4 RF) is, as always, only one: to be the fastest superbike in the segment. In order to achieve it, Aprilia drew from the best Aprilia Racing technology, carrying out continuous fine-tuning to the already exceptional RSV4 in many aspects, such as engine, electronics, suspension and brakes. ATC: Aprilia Traction Control, adjustable on the fly (without having to release the throttle) to 8 settings thanks to a practical joystick, boasts high performance operating logic. AWC: Aprilia Wheelie Control,the wheelie control system that can be adjusted to 3 levels, has extremely precise operating strategies. Wheelie control can be adjusted on the fly without closing the throttle, like the ATC, thanks to the practical left side electric block. ALC: Aprilia Launch Control, for use on the track only, with 3 settings, uses highly effective operating strategies. ACC: Aprilia Cruise Control. Electronic management has allowed cruise control to be introduced, very convenient on longer trips because it lets you maintain the set speed without touching the throttle. Aprilia RSV4 RR and RF are fitted with an exceptional dynamic controls package designed and patented by Aprilia. APRC (Aprilia Performance Ride Control) is the well known dynamic control suite derived directly from the winning technology in world Superbike, one of the most complete and refined currently available on the market. The particular positioning and orientation of the inertial platformthat governs the operation of the system allows for improved possibilities of detecting the bike’s dynamic conditions and, consequently, more effective electronic control strategies. The fourth evolution of Aprilia’s APRC is perfectly integrated with the electronic fine tuning guaranteed by the full Ride-by-Wirethrottle control which is completely built-in and requires no other components for electronic throttle valve management.This provides clear benefits in terms of weight (compared to a traditional system, the savings can be quantified at 590 grams). In addition to the fourth generation APRC system, RSV4 RR and RF come from the factory standard with advanced multimap Cornering ABS, developed in collaboration with Bosch to guarantee not only extreme safety on the road, but also the best possible performance at the circuit. The 9.1 MP system, with truly contained weight and dimensions, is able to optimize braking and the ABS intervention in corners, thanks to a specific algorithm that constantly monitors various parameters such as lateral acceleration, the pressure applied to the front brake lever, the lean, pitch and yaw angle, modulating the braking action in order to better guarantee the ratio between deceleration and stability. The ABS system works in unison with the Aprilia RLM (Rear Liftup Mitigation) system that limits the lift of the rear wheel during more abrupt braking. Cornering ABS, fine tuned in accordance with Aprilia’s specific indications, is adjustable to 3 levels of sensibility and can be switched off. Each of the three Cornering ABS maps can be combined with any of the three engine maps (Sport, Track, Race), allowing riders with different experience and skill levels to find the best possible combination for their style. The three maps are “full power” and differ in the way they unload the 201 HP of which the Aprilia V4 is capable onto the asphalt, in addition to the percentage of engine brake dedicated to them. The colour TFT instrumentation is a true digital computer with exceptional display features. The two selectable screen pages (Road and Race, both with night and day backlighting) correspond to as many represented indexes. Standard equipment for the RSV4 RF (and optional for the RSV4 RR), is V4-MP, the Aprilia multimedia platform that lets you connect your smartphone to the vehicle via Bluetooth, introducing for the first time a true corner by corner electronic settings calibration system with data that can subsequently be downloaded to your laptop (or displayed directly on the smartphone) for analysis, just like they do at the races. V4-MP is characterised by a new connection protocol that reduces smartphone battery consumption to a minimum, in addition to providing a wide range of circuits already mapped in which you can manage the electronic settings corner by corner, as well as user acquisition of a new circuit that is not in the list Aprilia has provided. V4-MP also includes the infotainment system, introduced by Aprilia for the first time on the RSV4, to manage voice commands and incoming/outgoing telephone calls with your smartphone. These activities are also displayed and managed by the digital instrumentation. The primary and unique characteristics of this gem of Italian technology, the ones that led to the creation of the best superbike of all times, remain unchanged. This is the world’s first full scale production motorcycle with a high performance narrow V4 engine, the most revolutionary and powerful engine ever built by Aprilia. An engine that has been made unmistakeable because of the use of “total” electronics, because of its extremely compact size and light weight. Power and maximum torque, respectively 201 HP at 13,000 rpm and 115 Nm at 10,500 rpm, remain at bar-setting values and are joined by the one-of-a-kind grown that has always been the true soundtrack Aprilia V4 engines have always offered. In order to combine high performance and reliability, extremely lightweight pistons were selected with brand new segmentsthat reduce the blow-by effect. There is also a honing treatment for the connecting rod heads that contributes to reducing friction. The valve return springs also guarantee reliability during heavier work loads, while the valves benefit from optimised timing. Last, but not least, the powerplant boasts an exhaust system with a silencer fitted with double lambda probe and integrated valve, while the gearbox has a linear sensor that guarantees impeccable shifting operation. 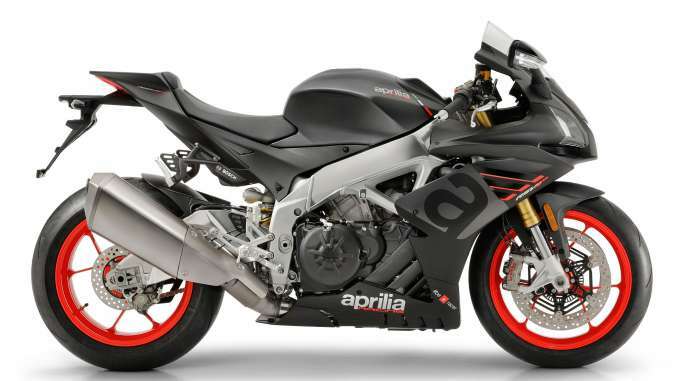 Aprilia is known as one of the best chassis manufacturers in the world and the RSV4 represents the synthesis of the technical prowess Aprilia has acquired in top level world championships. A particularity which is still exclusive to the RSV4 RR and RF (and which has always been a characteristics of the previous generation RSV4 models) is the exceptional possibility of adjustments that the standard equipment chassis is able to offer. In fact, the Aprilia is the only superbike that allows the rider to adjust the engine position in the frame, the headstock angle, the swingarm pivot and the rear end height, naturally in addition to the fully adjustable suspension. Just like a real racing bike. The RF version of the RSV4 offers sophisticated suspension systems with fine adjustments both in hydraulics and spring preload, higher performance and more than 800 grams lighter than the previous versions: the fork is a latest generation ÖhlinsNIX unit, as is the TTX shock absorber; the latter is operated by dedicated progressive linkage that increases the reaction time of the shock absorber itself. There is also an adjustable steering damper, also supplied by Öhlins. On the RSV4 range, Aprilia offers a Brembo braking system that is the absolute top of the line in this category: the front relies on a pair of new 5 mm thick steel discs with a diameter of 330 mm, gripped by the monobloc M50 callipers fitted with high friction coefficient brake pads. Aprilia RSV4 RR represents a top shelf technical platform, ready to provide the rider with a “race replica” performance and feeling. The RSV4 RR incorporates all the electronic, engine and brake features introduced on the sibling RSV4 RF. As standard equipment it also has features which were once exclusive to the Factory version, such as magnesium external housings, oil sump and head covers and a wide range of chassis adjustments. 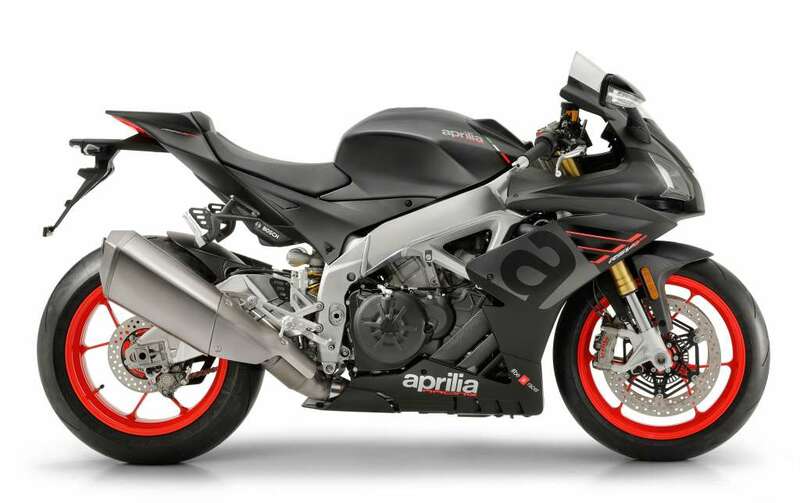 Aprilia RSV4 RR is available in two attractive new colour schemes, both matte, on a black and grey base (Rivazza grey and Arrabbiata black) with red wheel rims. 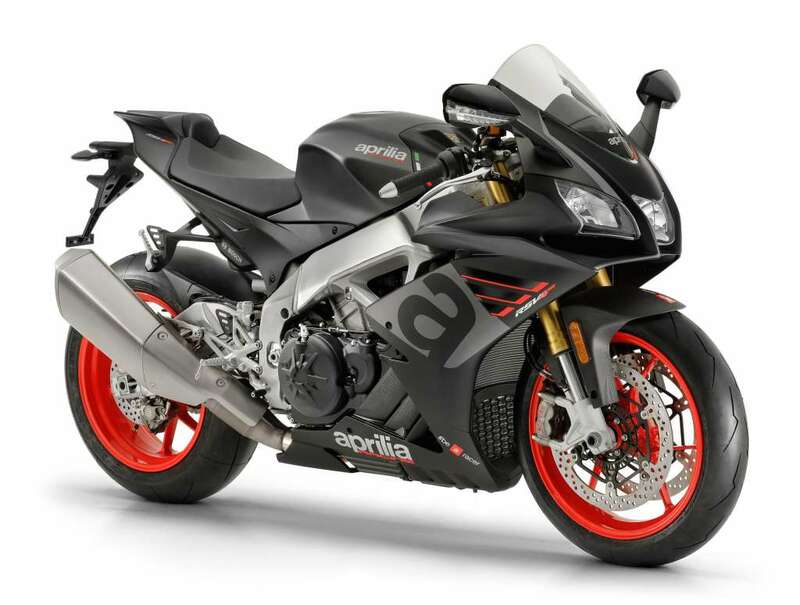 Aprilia RSV4 RF is the exclusive version that comes standard with latest generation Öhlins suspension systems and lightweight aluminium forged rims. It stands out for its dedicated “Superpole” graphics which combine colours where black and red dominate. Öhlins TTX shock absorbers (standard equipment on the RSV4 RF): the TTX line is the most prestigious of the products offered by Öhlins (top and bottom attachments are in billet aluminium). They allow full and fine adjustment in all shock absorbing functions. They can be fitted with linear sensors to install telemetry. ÖhlinsNIX Fork: (standard equipment on the RSV4 RF): top shelf performance on the track and on the road. A wide range of precision pre-load and hydraulic rebound and compression adjustments. Components in carbon: Carbon components: fairings, mudguards and heel guards. Made in matte finished carbon fibre. They guarantee a sporty look and lower overall weight. License plate bracket cover: made of laser cut aluminium, this is applied after removing the license plate bracket when using the bike on the track.